Detectives Beyond Borders: Anne Holt, or which crime writers should be in politics? 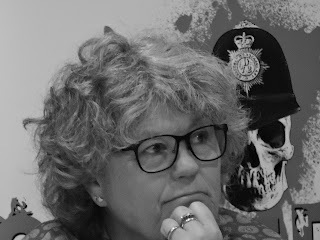 Anne Holt, or which crime writers should be in politics? Kati Hiekkapelto said during a panel on Morality, Society And Justice In Crime Fiction at Crimefest 2016 in Bristol last week that laws were made for middle-class white people. Anne Holt disagreed, invoking the Ten Commandments in citing laws as setting standards toward which humans can aspire. Anyone with a cursory knowledge of the two authors' résumés might expect as much: Hiekkapelto is an activist for immigrants' and refugees' rights when she's not writing her Anna Fekete crime novels, and Holt's CV includes a stint as Norway's minister of justice. It would be easy to tag Hiekkapelto as the rebel and Holt as the representative of the establishment, especially by the constricted standards of what passes for political discourse in the United States. One could almost think that Fear Not, whose plot turns in part on an asylum seeker's death, is a Hiekkapelto novel. But it's not; Holt wrote it. Elsewhere during Crimefest, Holt said she bristled at descriptions of her as leftist. Instead, she said, her political passion is human rights. That tells me that she's no doctrinaire politician, and Wikipedia describes her party, Norway's Labour Party, as social-democratic. Wouldn't it be cool if Holt were American? She could run for office as a Democrat, and Republicans would find it difficult to attack a candidate who cited the Ten Commandments among the touchstones of her conception of the law. Even a Republican Senate might be unable to stonewall her nomination forever. And wouldn't it be nice to have a crime writer in the cabinet or the White House? I wrote after last month's Edgar Awards that Walter Mosley and Sara Paretsky might make a good president-vice president ticket. Anne Holt, provided she could get the citizenship thing straightened out, could be attorney general. What crime writers would you like to see as presidents, prime ministers, or heads of government departments? Call it the Shadow cabinet. Derek Raymond ad Minister Of Health? Honestly, I wouldn't wish it on them. Nor would I, but some of them do make a better impression than some candidates do.